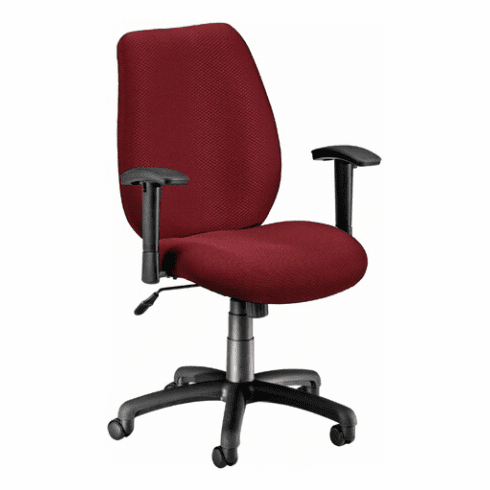 OFM Ergonomic Fabric Task Chair  Free Shipping! This ergonomic fabric task chair from OFM features a gently curved molded foam in the seat and backrest cushions that give day-long support. Other features include ratchet back height adjustment, 360-degree swivel, tilt with tilt lock adjustments, waterfall seat edge promotes circulation, pneumatic seat height adjustment, adjustable height padded arms, stain-resistant commercial grade fabric upholstery and a five star nylon base with dual wheel standard casters. This chair meets or exceeds ANSI/BIFMA safety standards. Additional caster options are also available for this chair. Dimensions: Seat Size: 20"W x 19.75"D. Back Size: 19.5"W x 22.5"H. Seat height adjustment: 17.5"-21"H. Limited lifetime warranty from OFM. This chair normally ships within 1-2 business days from our NC warehouse.